Thanks to the new Travel Inspirations Series here on Ciao Amalfi, I’ve had some of my favorite writers around the blogosphere stopping by and sharing some of the places around the world (and here in Italy, too!) that have inspired them. Keep watching in the coming weeks for some great new additions to that series. Experiencing Italy: Windows on the Amalfi Coast over at Cherrye’s blog My Bella Vita. Sunday Soul: Alone in Magical Amalfi, Italy over at Lisa’s blog Wanderlust Women’s Travel Dreams. Top 5 Reasons to Head South to Campania at Danielle’s website When in Rome Tours. Why Laura Travels over at Mike’s blog Fevered Mutterings. France Travel Series: Meeting a Myth in Paris at Robin’s blog My Mélange. It is no secret, that my all-time favorite place in the world is Italy. I remember the first time I visited – I noticed the stark difference between the American and the Italian lifestyle. How family, friends and food seemed to play a large role in their lives. How the Italians really don’t eat junk food, they cook their meals from local, fresh, in-season ingredients. They shop at the local food markets. They take their time – often spending hours in the kitchen preparing food or an equal amount of time enjoying the meal. Italians seemed happier, healthier and less stressed out. I also felt more relaxed, less stressed out and seemed to adjust very well to naps in the afternoon, long lunches and eating and drinking for pleasure. That trip to Italy really changed me and the way I looked at life. And though I realized that I was only on vacation, and the likelihood of living in Italy anytime soon was a long shot at best – that didn’t stop me from trying to bring a little bit of that Italian culture and lifestyle home with me. When I arrived home, I decided to make some small, conscious changes in my life. Italy inspired me to live a happier, healthier lifestyle here at home. I began shopping more at farmer’s markets, buying in-season local produce. I cooked more at home and ate out less. When I did eat out, I chose mom-and-pop type restaurants who also focused on using seasonal local produce and I stopped frequenting chain restaurants. I sought out Italian trattorias, wine bars and cafes in my area that resembled what I fell in love with in Italy so that at any given time I could be transported back, even if just for a few hours. I made regular trips to my local Italian deli/gourmet shop and added lots of authentic Italian made products to my grocery list – like prosciutto di parma, cured meats, salumi, olives, focaccia bread and a variety of imported Italian cheeses. I take walks after dinner, enjoy spending time in the kitchen preparing homemade pasta and spend time every week, generally Sundays, sharing a nice dinner with good friends, complete with laughter, wine and an Italian language lesson thrown in for fun. Italy has inspired me in so many wonderful ways – I would have never imagined that traveling to another country could have had such a positive impact on my life. * All photos used in this post are © Robin Locker and cannot be used without express permission. Robin Locker is a France and Italy travel consultant, freelance travel writer and photographer who hopes to one day realize her dream of living La Dolce Vita in her beloved Italy. She writes about travel for MNUI travel insurance and on her own site, My Melange. She is addicted to social media – you can follow her on Twitter @MyMelange. How well do you know the Amalfi Coast? Think you know every twist and turn of the Amalfi Coast? I was just sent the link (thanks, Mom!) to a fun article on the Amalfi Coast Drive on the National Geographic Traveler website. Head over and take their quiz to see how well you know the Amalfi Coast. Some of the questions are tough, but you might just learn a few new things about the Amalfi Coast. I know I did! I’ll own up that I missed the question about the four corners of the Villa Rufolo in Ravello. What was your score?? So far the Travel Inspirations series has taken us to Hiroshima with Abigail King and Australia’s Gold Coast with Cecil Lee. As I read these thoughtful guest posts, I’m reminded what it is that inspires me about daily life on the Amalfi Coast. 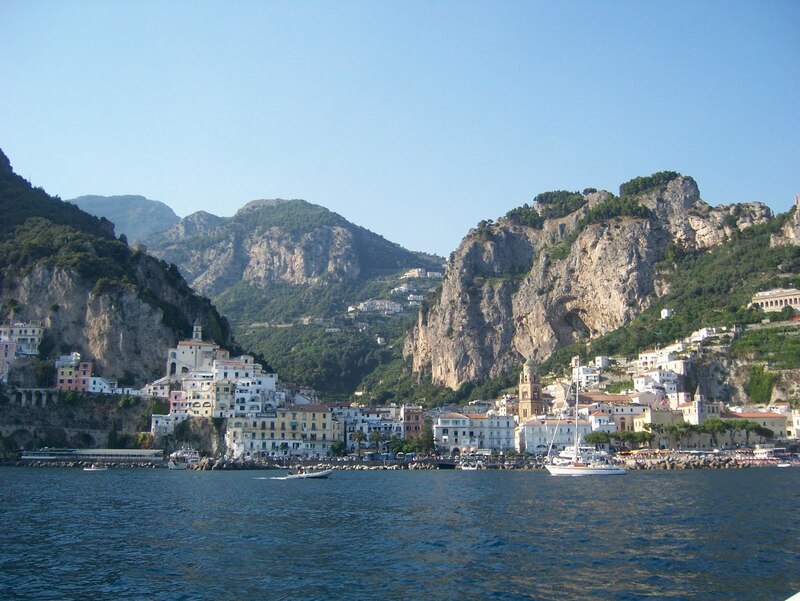 I’ll be sharing some links to my writings on that topic here on Ciao Amalfi very soon. But, in the meantime, we’re off to Greece! This week Mike Sowden, writer of one of my new favorite blogs Fevered Mutterings, is taking us to the dreamy Cyclades Islands. Welcome, Mike! There’s somewhere near a dozen of them, hugging an invisible line ten paces inland from the ferry’s gangway. (I later learn this is as far as the police will allow them, prompted by a rise in aggressively touting hoteliers in recent years). They’re waving placards and holding up photos, but I adopt a polite grimace, duck my head and walk past, straight across the painfully sunny square and into the Tourist Information office. Half an hour later, I’ve been fixed up with a gorgeous one-bedroom apartment with veranda, double-bed and complementary Greek coffee – for 20 Euros a night. Bless you and your consistently reliable advice, Rough Guide to Greece. You’ve done me proud. I’m on Naxos for 3 days, so I can afford to goof off for the afternoon, lazing round the blazingly whitewashed town and scorching my toes on the beach sand. It’s absurdly hot – particularly for a pasty-limbed Brit like myself – and it’s not long before I’m back in my room, seeking the twin solaces of shade and icecube-chilled water from the ensuite fridge. I open my Rough Guide again. Now here’s the thing that struck me almost immediately and that has haunted me ever since. Naxos is the largest of the islands of the Cyclades and is the Greek islands in not-so-miniature: a wealth of olive-groved valleys, golden beaches and bone-dry mountain slopes. It’s also two destinations – the gateway port of Naxos Town, geared for daytrippers, and the interior of the island where you’ll find the Naxos of old getting on with daily life. And getting from one to the other takes time and planning – neither of which I had in abundance. So apart from some mild exploring, I stayed put. I sipped kitron, the famous local liqueur made from citron fruit, a sibling of the lemon. (Delicious). I chased Naxian olive oil around various plates with hunks of heavy home-baked bread. I blackened to a crisp on the beach (to then spend the following week carrying my backpack on sunburnt shoulders, which probably tells you a lot about my ability to forward-plan). But Naxos? I’ve hardly seen any of it. And that’s why the ‘unexplored interior’ calls to me, like no other place, like only imagined destinations can. And that’s why I’ll be back. Mike Sowden is a freelance travel-writer and blogger. He writes about travel for MNUI travel insurance and for his own site Fevered Mutterings. Catch up with him on Twitter @Mikeachim. This week has been the classic mix of the rain showers and glorious sunshine that herald the arrival of Spring. This is the time of year I don’t mind not having a car or scooter as walking becomes even more pleasurable an experience than usual here. Over the past few weeks I’ve made one of my favorite walks many times, each trip noting the blossoms and tiny leaves growing larger and brighter. While the sun was shining the other day, I took my camera along and photographed the blossoms along the way to share some of the beauty of spring on the Amalfi Coast here on Ciao Amalfi. Happy Spring!! These wisteria photos are just a mere temptation of the beautiful blossoms bursting forth all over the Amalfi Coast. The wisteria is in bloom, and this is one my favorite events of the year here. Head over to Bell’Avventura where you can see just how gorgeous it is in Scintilla’s recent post Desperate Housewives on Wisteria Lane – Eat your heart out!